We need to develop the habit of being grateful for who God is and what He has already done for us. It is easy to take things for granted. For example, you are reading this book. Have you thanked God for the fact that you are able to see, and you know how to read? If we look for things to thank God for, we will find more and more reasons to be grateful. And if we look for things to complain about, we will find more and more reasons to complain. When the Israelites came out of Egypt and went to the Promised Land, they kept complaining. They got bored with eating manna every day and wanted to eat something more flavorful (with garlic and leeks). So they complained about the miraculous food that God provided. They complained when they had no water. God miraculously supplied water for them, but we have no record that they were grateful for it. And what was the end of the matter? That generation died in the wilderness because they refused to enter the Promised Land when God told them to. They didn’t trust God to deal with the giants there. This is an example of how a lack of gratitude can result in a lack of trusting God. And that can lead to a lack of obedience (i.e., rebellion against God). And God came through for them. He miraculously delivered them from their enemies. We can choose to develop the habit of thanking God. We can look for things to thank Him for. We can thank God and praise Him even when we don’t feel like it. Betsy ten Boom was able to love the Nazis and pray for their salvation even while surrounded by the horrors of a death camp. Instead of seeing the prison guards as being monsters, she saw them as being trapped and tormented. She saw their need for God’s love and forgiveness. She prayed for their salvation, and by her example she led other prisoners to do the same. At first Corrie hated the Nazis, but eventually she was able to forgive them. After the war she heard that Jan Vogel, the man who had betrayed her family, was in prison and was to be executed. She wrote to him, telling him that she forgave him, and telling him about the love of Jesus Christ. Shortly before he was executed, Jan Vogel wrote back to Corrie, telling her that he had become a Christian. When Corrie was ministering in Germany, a man came up to her after the service. He had been a prison guard in Ravensbruck, the death camp where Betsy died. He held out his hand to Corrie, asking if she forgave him. At first, Corrie was overwhelmed by memories from the prison camp, and she froze. Then she asked God to help her love this man. She forced herself to put out her hand to take his. When they held hands, God’s love flooded Corrie’s heart, and she and her former tormenter embraced one another as fellow children of God. Corrie’s love wasn’t strong enough to love that prison guard, but God’s love was. God filled Corrie’s heart with His love for that man, and broke down the barrier between them. We can’t live biblically unless we have confidence that the Bible means what it says, that it is reliable, and that it is credible. Many problems that people have with Scripture are caused by heeding Scripture “experts” who don’t use common sense. For example, Jesus gave the “Sermon on the Mount” and the “Sermon on the Plain.” Some “experts” consider that to be a contradiction. Was it a mount or a plain? They have forgotten something. Jesus was a traveling preacher who taught for three years. Therefore, He taught from many mounts and many plains and from ships and from seashores and in houses and from every kind of place that a person could preach from. Similarly, some people raise questions because Matthew, Mark, Luke and John have different versions of a parable or a teaching. Again, they have forgotten that Jesus was a preacher. And in real life, traveling preachers use the same teachings and illustrations many times, with small variations in how they present them. Some people are troubled if Matthew, Mark, Luke or John have differences in how they relate something that happened. For example, with the blind beggar Bartimaeus, one of the Gospels mentions two blind men but the others only mention one blind man. Well, in real life, if you had four people witness an event and write about it, you would have variations in the reports. Different people would focus on different things. So, with the four Gospels, we have four independent eyewitnesses writing of their observations rather than four story tellers comparing notes and copying from one another. As far as the number of blind men goes, there were many beggars on the roadsides, and some of them were blind. It would not be unusual for a blind beggar like Bartimaeus to have friends who were also blind beggars, and to want to be with his friends. So one account mentions Bartimaeus’ fellow beggar, and the other accounts don’t. There is nothing unusual about that. It’s the kind of thing that often happens in real life. Another thing that causes problems for some people is differences of writing style in Paul’s letters. In real life, writing style and vocabulary depends on whom we are writing to and on the subject matter. We should expect Paul to write to Gentiles differently than he writes to Jews. We should expect him to write to mature Christians differently than he writes to immature Christians who are having a lot of problems. We should expect him to write to Timothy (a fellow minister who was close to him) differently than he would write to people he hasn’t met. Think about your own letters and e-mails. Would you write to your boss the same way that you write to your son or your daughter? Would you write to a nonbeliever the same way that you write to your pastor? Would you write about a football game the same way that you write about a research project you are doing at school? Sometimes Greek verb tenses can cause confusion. For example, 1 John 1:8 says, “If we say that we have no sin, we deceive ourselves, and the truth is not in us.” So John is saying that we all sin. But later, in 1 John 3:6 he says, “Whosoever abideth in him sinneth not: whosoever sinneth hath not seen him, neither known him.” Now that could be confusing. The problem is the Greek verb tense. 1 John 3:6 is saying that if we abide in Him we do not keep on sinning—it’s not a one-time event but a lifestyle. Any Christian can sin and repent. That is very different from purposefully making a habit of sinning. Some scholars say that the Sermon on the Mount is a compilation of teachings rather than one sermon. They have forgotten something. We live in a televised world where many people have short attention spans, and many preachers have short sermons. Back in 1858, when Abraham Lincoln debated Stephen Douglas (the famous Lincoln-Douglas Debates), each debate lasted for three hours. So people in those days were able to do serious listening for three hours straight. I did an experiment. I read the entire Sermon on the Mount out loud, at a slow, conversational pace. (It’s the Gospel of Matthew, chapters 5 through 7.) It only took 15 minutes. Surely Jesus preached longer than that to people who may have traveled several-days journey to listen to him. He was only going to be with those particular people one time. So He had to get as much truth to them as He could during that one time of preaching. We know that Jesus and His followers did some lengthy preaching. On one occasion, the Apostle Paul preached all night long, until daybreak (Acts 20:7-12). Similarly, Jesus said that if someone sues us for our tunic, we should let them have it, and even our cloak as well (Matthew 5:40). That is just some clothing. Although clothing was more difficult to obtain back in those days than it is now, it was still just clothing. Jesus did not say that we should allow people to take our home and our farm or business, so that we and our family become homeless and destitute. By comparing Scripture with Scripture, we can see that Jesus had a very balanced view of how to live at peace with our fellow man. How can we beware of them if we can’t recognize them? How can we warn our friends and family to beware of them if we aren’t allowed to say anything negative about anybody? According to what Jesus said, He expects us to be able to recognize false teachers and to discern the difference between good and bad fruit in a person’s life. How do we reconcile that with not judging people? According to my study Bible, Jesus warned us against condemning the motives of others because only God knows their hearts and their motives. We cannot condemn people. However, we are expected to be “fruit inspectors” who can tell the difference between people who teach Christian truth and false teachers (Matthew 7:15-20). This is why Paul did not hesitate to name names when it came to identifying those who teach destructive heresy (2 Timothy 2:17). In addition, Jesus commanded us to “judge righteous judgment” (John 7:24). Here is a practical example from real life. If we have reasons to question someone’s morality and their level of responsible behavior, we cannot condemn them because only God knows their heart. However, we should not let them babysit our children. And it would be foolish to become business partners with them. If we come across a passage in Scripture that doesn’t make sense to us, we can ask God to help us understand it. If we pray, and consider that passage some more, and we still can’t understand it, then we can just set it aside and go on reading. There have been times when a Scripture passage that I didn’t understand before suddenly makes sense. It’s like a light goes on, and I can see it. 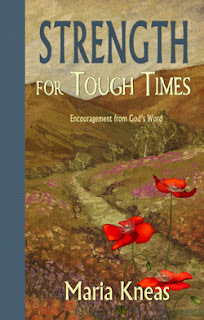 This is a small book but it is full of scriptures, poems, hymns, and essays to encourage us that no matter what the circumstances, God is there and will see us through it. The author herself has been through tough times, watching her husband die and she herself is a cancer survivor who can testify of God’s faithfulness. . . The book is divided into chapters about trusting God, strength from scripture, common sense and the Bible, blessings in disguise, overcoming obstacles, forgiving, and facing the unexpected. Throughout are black and white photos and illustrations that add even more beauty to the words. It is a book that will bless anyone who is struggling, and will provide life-giving focus on the truth of who God is. It would also be a great gift for someone you know who is going through a tough time.